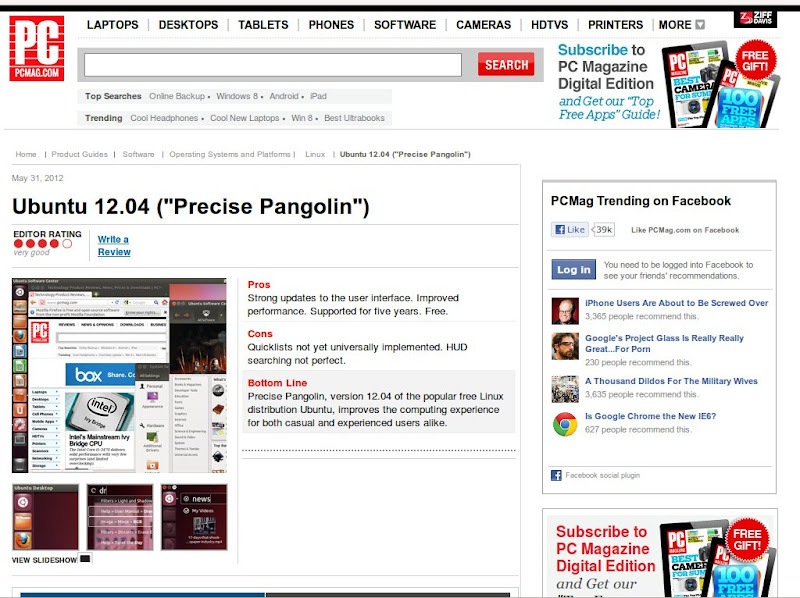 "Precise Pangolin, version 12.04 of the popular free Linux distribution Ubuntu, improves the computing experience for both casual and experienced users alike." "With Ubuntu 12.04, Canonical has shown itself to be unusually cagey. As Microsoft pushes itself (and its users) toward Windows 8 ...Canonical is continually in the process of making its software more like what Microsoft used to make—all while still acknowledging (with its bet-the-farm reliance on Unity) that the computer world is evolving. In fact, 12.04 seems to be as much about Windows 8 (and its potential refugees) as it is about Ubuntu ... I'm not positive that Ubuntu is yet the one-to-one Windows replacement it's obviously aspiring to be, but 12.04 comes tantalizingly close to the mark. Whether the gamble will pay off remains to be seen, but it's obvious that this pangolin isn't just precise - it's also incredibly prudent."